Fumaria Linn., Sp. Pl. 699. 1753. Gen. Pl. ed. 5: 314. 1754; Boiss., Fl. Or. 1:132. 1867; Hook. f. & Thoms., Fl. Ind. 1: 138. 1955. Hook. f., Fl. Brit. Ind. 1: 127 1872; Pugsley in J. Linn, Soc. Bot. 44: 250. 1919, Fedde in Engl. & Prantl, Pflanzenfam. Ed. 2, 17. b: 141. 1936; Popov in Komarov, Fl. U.R.S.S., ed. 2, 7: 706, 1937, Clapham et al, Fl. Brit. Isles, ed. 2, 104. 1962; Tutin et al, Fl. Europ: 1:255. 1964; Davis, Fl. Turk. 1: 242. 1965. Annual (rarely perennating) often scandent herbs, glabrous or subglabrous, glaucous, with almost all cauline leaves, irregularly 2-4 pinnatisect with many usually very narrow segments. Racemes short, generally leaf-opposed, bracteolate; bracts often short, linear, rarely as long or slightly longer than pedicel. Flowers small, zygomorphic, white, pink or purplish, very much like Corydalis but spur very short. Sepals 2 or obsolete. Petals 4, only the upper spurred; spur much shorter than the lamina; inner 2 narrower than the outer ones; lower petal keeled. Ovary 1-celled, usually suborbicular with 1 (-2) ovules on each placenta; style short, often filiform with entire to somewhat lobed stigma. Fruit a I-seeded, ± globose nut, rugulose or smooth when dry, with 2 apical pits; seed usually large, suborbicular, brownish. About 50 species, chiefly of the temperate and cooler regions of the old world and often as weeds; only 2 species are recorded for our area. A difficult genus and most of the species are variable, affected by light and shade conditions. Sometimes plants grown in shade have small cleistogamous flowers and a typical leaf segment. Flower colour fades under preserved condition and must be noted when fresh. The fruit is sometimes joined by the expanded top of the pedicel by a narrow fleshy neck, distinct only in fresh conditions, which also must be noted during the time of collection. 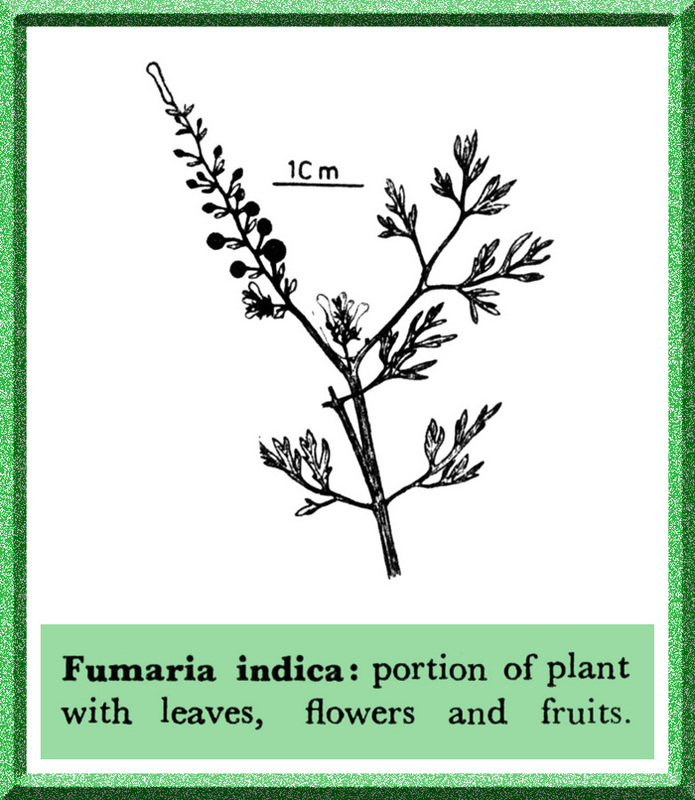 Fumaria parviflora ssp. vaillantii* (Lois.) Hook. f. & Thoms. = Fumaria vaillantii Loisel. Fumaria schrammii (Aschers.) Valenovsky = Fumaria vaillantii Loisel. Fumaria vaillantii var. schrammii Aschers. = Fumaria vaillantii Loisel.